Marcus Maddison should be in action for Posh at St Neots. Photo: Joe Dent/theposh.com. Peterborough United are sending a strong reserve team to contest a friendly at St Neots Town tonight (March 24). Senior players Marcus Maddison, Ricardo Santos, Harry Beautyman, Erhun Oztumer and Aaron Mclean are all expected to feature in the match. 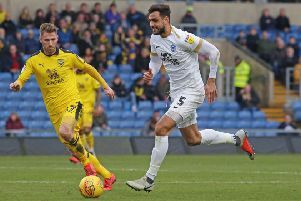 Posh may also give Christian Burgess and Shaun Brisley a run out at the heart of the defence in preparation for this Saturday’s (March 27) League One match with Coventry City at the ABAX Stadium. Burgess and Brisley are expected to start together against the Sky Blues as first choice centre-backs Santos (suspended) and Gaby Zakuani (international duty) are unavailable. Maddison is available for first-team duty on Saturday after completing a three-match suspension. Admission is just £5 for adults and free for under 16s. Posh will drop out of the League One play-off places tonight if Rochdale win at Oldham.